If You Like To Eat Fish, Read This! I don’t generally like to visit politics on this site, but given recent events, it might be important to mention them, or at least one of them. I like to eat fish, such as Trout, Bass, Bream and Perch. When I go fishing, though, I want the water to be clean and inviting. Orange or Gray with unidentifiable debris floating around doesn’t really help my appetite any. This past week, the EPA lifted the ban on coal mines dumping their waste into nearby streams, rivers or other waterways. It was apparently at the urging of the President, or congress. In any case, it ain’t good. It was done according to mine bigwigs, in order to facilitate the hiring of more workers. Somehow, I guess, it takes more employees to dump it nearby than it does to haul it elsewhere to dump it. Part of that regulation also stipulated that the mine company had to restore the property back to the way it was before they began operations. Now, if I lived in West Virginia, Pennsylvania, Illinois or any other state where this lack of give a damn affected my ability to eat healthy, I’d grow my own fish. This, when combined with growing your own vegetables, is called aquaponics. If you have some space at your home you’ve been looking to utilize, such as a garage, a shed, a barn, something like that, you can get a sizeable container, fill it up with water and raise fish in it. I did this with a livestock watering container that held 100 gallons of water. It wasn’t that big, either, just about 5 ft. long, 2.5 ft. wide and about 2.5 ft. deep. Of course, you’ll want your water to be similar in temperature and depth of the natural environment of the fish you’re raising and you wouldn’t want to over crowd them. The photo shows a small design by Travis Hughey, who actually travels all over the world helping people in need, learn self-sustainability. If you click on the pic, you’ll be taken to a manual of his on this subject. In a container like this you will also need a way to clean out extra food that the fish don’t eat, as well as some of the excrement that isn’t pumped out. Pump?! What pump? Well there is a certain amount of nutrients in the fish excrement that is beneficial to plant growth. It isn’t all the plants need, though there is no shortage of so-called experts that will tell you otherwise, but it does help in the development of your vegetables. Ideally, you will have a pump moving the water from your fish tank, to your grow bed or beds, where it will create useful bacteria that will feed your plants and drain from there into a sump tank where it will be filtered while being pumped back into your fish tank. If your filtering is right, the water being moved back into the tank should be clean. However, there will always be parts of fish waste and uneaten food that will settle to the bottom of the tank and will have to be manually removed. The reason I mentioned doing this inside, is so you can control the environment. The most popular fish to raise with this method seems to be Tilapia, but of course, that isn’t everyone’s favorite. If you prefer Trout, you will need to keep your water temp down around 50 degrees or lower. If your fish tank is outside during the summer, it could get too hot and kill your fish. On the flip side, you may be raising a warm water breed, such as catfish, and struggle to keep the water warm enough during the winter months. This method of farming also saves water. If as I said earlier, your filtering is right, you shouldn’t need to add more than 5 gallons of water per week. There will always be a small loss of water due to evaporation if nothing else. Grow media doesn’t have to be dirt either. I used to cut plastic 55 gallon drums in half and use each half as a raised garden bed. I bought small rock from Lowes and Home Depot to use as my medium. I also put 40 or 50 worms in each one to keep the bed clean and the worm casings left behind also have a nutrient value to the plants. Sylvia Bernstein is one of the noted experts in the Aquaponics field. She has written more than one book on the subject, and can be relied upon to give one the correct information to get started. It isn’t necessary to use equipment designated for aquaponics-you could always use other products to get started. Plastic 55 gallon drums (food grade only) are good for small fish tanks and grow beds, and most everything else can be found at Home Depot, Lowes or your local hardware store. 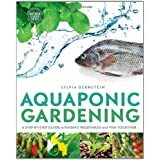 If you click on the pic of Silvia’s book to the right, you’ll end up at Amazon where you can find many books on aquaponics, as well as hers. Another place to get information is brightagrotec.com. This is a group of folks in Wyoming that use several types of farming, mostly inside, and are quite successful. They’ve done many instructive videos on aquaponics and vertical farming, explaining what and why in regards to nutrition, hardware, grow mediums and everything having to do with aquaponics. In the end, there are only three choices. You can run for congress and try to enact laws that are beneficial to the vast majority, you can sit around the barber shop or country club and complain, or you can take the reins and guide your own life to where ever you think it should be. Personally, I’m for the latter. I don’t want anyone or anything outside of myself to decide how or how well I will live.